Keep this information about fire extinguishers in mind so you can protect your business. When it comes to protecting your business from a fire emergency situation, there is a lot to know. In fact, with different types of fire extinguishers out there and knowing how to properly use said fire extinguisher, it can be overwhelming. However, knowing what to do in a fire event, being proactive and calm will make the whole situation less scary and allow everyone to evacuate safely. 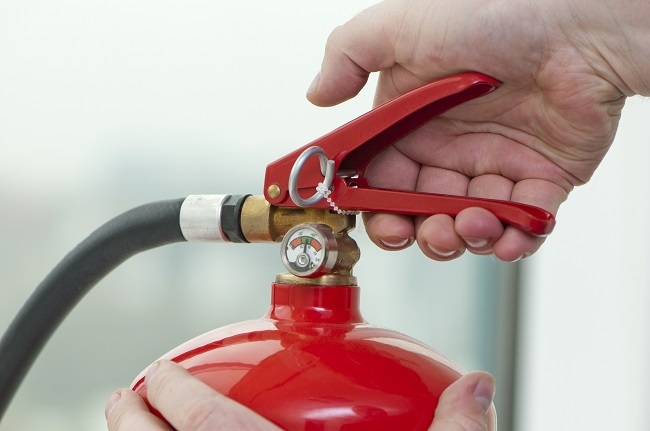 Here are some of the important things to know about having fire extinguishers in your business. It is imperative that business owners understand the importance of having proper fire extinguishers in their place of business. In fact, it is crucial that all business owners take the time to ensure that the different fire extinguishers in their business are the right type for the kinds of fires that may occur. This all relies on the various materials that are present in your business. There is nothing worse than not knowing how to properly use a fire extinguisher in the event of a fire emergency event. In fact, being aware of the proper technique about using a fire extinguisher can really make all the difference. The first step is to pull the pin. This requires an individual to hold the fire extinguisher with the nozzle pointing away from you, and then release the locking mechanism. Then, you’ll want to aim low. This is crucial- point the fire extinguisher at the base of the fire. Then make sure to squeeze the lever very slowly and evenly. Finally, be sure to sweep the nozzle from side-to-side. At the end of the day, it is important that all business owners are proactive when it comes to the fire extinguisher situation they have going on in their place of business. In fact, being mindful of what types of fire extinguishers you have in your business can really be the thing that keeps your business safe in a fire emergency situation. This entry was posted on Thursday, February 7th, 2019 at 12:38 pm. Both comments and pings are currently closed.